Our site, the CoLab, feels a strong urgency to act. And we want to amplify our urgency bringing it to the attention of those urgencies of all sites who seek to articulate their value as invaluable expert voices in the larger political discourse around education reform, ’21st century learning,’ the Common Core State Standards, and the reauthorization and waivers in NCLB. We believe that sites innovating upon their NWP-principled work can learn a great deal by learning to theorize and name, rethink and enact the purpose for their work and existence. Expanding upon this self-articulating and naming process which we believe sites should engage upon systematically, such focused endeavors have the power to surface cross-site collaboration. We believe that conversations around the “so what?” of their work that sites articulate can indeed bring sites’ local knowledge and innovations into a global conversation across the national network. It is only through this shared endeavor of naming and innovating, that we believe that NWP sites will have greater relevance in conversations in educational reform in this second decade of the 21st century. We suggest we harness a bit of productive-play and creative-innovation and invent an unConference of sorts within the spaces and places of the Annual Meeting. What if we had a (semi)spontaneous experience during the Annual Meeting, where we immediately build upon what insights and directions emerge from the meetings and conversations? I just think that the time has come for us to innovate ourselves in ways really unimaginable at this moment. I know great innovations are possible; it’s the only way our site has grown in relevance at the local and national level. Here’s some of what we’ve been up to…Let’s CoLab and innovate! This short piece is a discussion* on a theme from a manuscript we have submitted for publication. We articulate and ground our theory of action in a story of how our site developed a year-long professional development program for a local school district. In doing so, we reveal essential theoretical and pedagogical innovations in site work that we believe may be strengthened by collaborating with other sites doing complementary work in particular on how sites build their leadership capacities revolving around the site’s core principles of practice.The human-centered approaches we describe are grounded in and grow out of the powerful juncture where the field of education and the discipline of design intersect. IIMPs (Inquiry Into My Practice): a collegial approach to rethink teaching events as prototypes. PILA-Worksheet: a way for recasting existing curriculum within a human-centered pedagogy. Our PILA (Principled Intentional Literate Actions – see Image 1) approach grew out of a year-long professional development contract the CoLab led with a local school district “Bellham District 118” of 11 schools, 9 K-6, 2 Middle School. The knowledge developed from this year-long process immediately informed our site’s approach for re-thinking how it structured its Continuity programs and its 2011 Invitational Summer Institute where it revised existing cultural practices, and prototyped revised ones featuring insights that emerged from the year-long professional development with the school district. We developed for the district a 9-month, 5-phased, program we called: “Writing-Rich and Writing-Strong: Growing Taller in Our Teaching and Deeper in Our Learning.” During Phase 1, using ResponsiveDesign™ (discussed later), teachers interviewed each other about what would constitute their ideal classroom where students were fully engaged. During an empathy-building phase, all teachers (350+) learned our ResponsiveDesign™ approach to identify professional needs statements. Using artistic materials, teachers engaged in an 8-minute design-challenge to create a physical representation of that ideal classroom for each other (see Video at top of page). Teachers then analyzed their physical prototypes they had created, and surfaced Principled Elements of a Writing-Rich and Writing Strong Classroom. This systematic process occurred for all grade level and content area teachers. Through Phases 2 & 3, once all grade and content level meetings concluded, the CoLab took all 10 sets (K – 6, Middle School: Math/Science; Studies; Language Arts/Social Studies; Fine/Industrial Arts) of Principled Elements of a Writing-Rich and Writing Strong Classroom and analyzed them, surfacing 5 key domains (safe risk-taking learning community; teacher modeling & co-constructing literate practices; numerous focused literacies-learning opportunities for learning; critical reflection by teachers and students; and time & space to collaborate), which we then formulated into PILA as a way to organize instruction. In Phase 4, the CoLab led a “Boot Camp” specially made for the school principals to assist them in developing a shared language for supporting the district-wide program. PILA (See Image 1) would be explored in-depth much later during the last phase. Phase 5 comprised School-Based meetings involving all teachers to share and learn from each other’s year-long inquiries into their practices, and, begin surfacing a shared language for instruction. PILA is way of thinking about planning for, enacting and reflecting upon instruction that accounts for all the Principled Elements that teachers surfaced in their Design Challenges. Each ellipsis is a scaffolded experience within an unfolding lesson or learning sequence. We intentionally adopted the moniker IIMP to precisely name and rethink how we conceptualize a teaching and learning event, or lesson. When viewed as an inquiry into practice, our stance and posture as teachers shift from a lesson as something fixed, to envision the learning experience as an exploration or journey of discovery. During our Invitational Summer Institutes, for example, we moved away from naming teachers’ demonstrations as demonstrations or exemplars, to IIMP’s. This shift in language, therefore, recasts that fixed lesson as a malleable prototype of sorts that the lead teacher will enact in the company of her peers. Interacting with and Learning from: Refers to the approach we use when exploring content or any phenomenon. For example, in a science class, students may be learning photosynthesis. That would be the content, that the teacher is guiding students to interact with and learn from. This perspective results in teachers needing to account for the particular pedagogical moves and language that will be harnessed to enact that particular part of the ellipsis, and, how the next part of the ellipsis will build upon what came before. Learning Technologies: Refers to how we conceive of the tools students and teachers use for learning. For example, a Quick-Write, question-asking, a Double-Entry Journal, or, Class Discussion, when viewed as a learning technologies, or tools, require the teacher and the learners to ask: “Why am I using these tools, and, what am I building with them?” Though it’s important that we equip students to develop expertise in the literate practices, or tools, in their schooling, without a fundamental shared goal or focused larger outcome, students may experience their schooling activities as discretely unrelated. This is analogous to, for example, knowing how to use a screwdriver and a saw really well, however unless I see myself as a carpenter nor know how to build a house, those tools are not being harnessed to their fullest potential. From this perspective, then a keen level of intentionality must be addressed to determine the purpose for a particular technology’s use, and, what the larger architecture of the learning experience actually could be. Together, these mutually-supporting dimensions of instruction help us account for the ways we will support learners-in-learning by accounting for the pedagogical moves we summon, and, the technologies we need in order to create powerful learning experiences. From this level of intentionality, hence, Principled Intentional Literate Actions (PILA) becomes a useful way for thinking about pedagogy as it provides us with a conceptual language for accounting for how learning can become expansive phenomena, like ripples in a pond, which we must assist ourselves and our students to harness. In harnessing those experiences, therefore, we can apply at various levels of awareness what we’re exploring, and, the insights that emerge from those learning explorations. In this way classroom or museum walls become permeable because we have a way to navigate them using PILA. Working with the 11 schools, 9 elementary and 2 middle schools, we harnessed our ResponsiveDesign™ (see Image 2) theory of action to learn what the schools and districts wanted in order to grow. In Phase 1, we initiated a series of ethnographic interviews, in what we call our intense ethnosleuthing phase, for teachers at all grade levels and the school/district administrators. The CoLab assembled its DesignTeam and began to create low-resolution prototypes of models that would successfully address the school districts’ articulated desires to integrate writing as a tool for learning in all grades and schools, grounded in a shared language of practice. This focus was also to be grounded in teachers developing and applying understandings of the forthcoming Common Core State Standards. We “tested” or enacted these prototypes with a cross section of district teachers and administrators to fail very quickly early on, modify the prototypes during the immediate next iterative cycle in order to tailor the outcome to the teachers’ professional needs. Enacting those practices within classroom settings. Explore, envision and enact are actions that characterize the stance at the center: a learner with prototyping habits of mind. Therefore, the CoLab’s prototyping growth mindset, catalyzes creativity by exploring, envisioning and enacting bold and innovative solutions to everyday educational problems. When an IIMP is enacted by the lead teacher she first has a public conversation in front of the “learners,” or her fellow peers with the assistance of a “ThinkingPartner.” The ThinkingPartner harnesses our ResponsiveDesign™ methodology and asks her what she will explore in the IIMP, what she envisions will unfold, and, when enacted, what she wants the learners to walk away knowing, caring about and able to do. The lead teacher enacts the teaching part of the IIMP, and once concluded, the ThinkingPartner and the lead-teacher have a second conversation, this time to address what was explored, envisioned and enacted. The audience shifts its role from learner of a particular content enacted during the IIMP, to critical peers. Immediately following the IIMP, we use our 3×2 Debrief approach (see Image 3), where participants immediate list three actions they witnessed during the IIMP. This is followed by listening in on the ThinkingPartner and lead teacher discuss what was explored, envisioned and enacted in the IIMP. Following this public conversation, the audience then jots down three more actions that came to mind. Then the audience is instructed to discuss their notes from the 3×2 Debrief with a partner, then, a larger public conversation takes place, where the lead teacher acts as listener and or addresses any questions that may arise. Figure 4 shows our PILA-Worksheet. It is a rehearsal tool, using a writing to learn and writing to plan approach for envisioning a lesson from the PILA pedagogical stance. We learned that it was indeed powerful to cast “exemplars” of powerful classroom practices as IIMP’s to demonstrate the power of collegially planning a lesson as an inquiry into practice. We also learned how important it was to distinguish between the pedagogical moves and the tools which would be harnessed in a learning cycle. However, we needed a way to help teachers try on these approaches into their everyday teaching practices with their mandated curriculum. This PILA-Worksheet is simply an organizational tool for thinking about and recasting existing practices in principled ways that engage learners in learning authentically powerful experiences. The PILA process, or consequentially unfolding learning, can be used to envision an entire school year from the largest scale of resolution, to, an individual lesson, a smaller scale of resolution. The Lead Designer: A experienced enactor of the CoLab’s ResponsiveDesign™ methodology. The Associate Designer: A newer and experienced Thinking-Partner and enactor who works with the Lead Designer. The Assistant Designer: A Fellow within the CoLab’s ISI and Professional Development community offerings who has been identified as having leadership and expertise potential. This person’s primary job is to observe the Design Team explore, envision and enact its plan, study the enactment, and “Learn to Lead” by being fully present. Within this collective, 3-person team, structure the newest member was provided opportunities to ethnographically study the lead and associate designers’ plan and lead a day’s activities with the teachers. After the event, the three debriefed the experience, which provided all with another opportunity for professional growth, that of developing a meta-discursive language of and for practice. Eventually, the associate designer would assume the Lead Designer role, and, the assistant designer assumed associate role, while the former lead designer would observe the two and provide feedback. This ‘learn to lead’ approach has served us to successfully meet the growing demand from districts in our service area for innovative and human-centered professional development. A second level of growth emerged for the Bellham 118 teachers as they experienced growing as individuals and as a school community by using ResponsiveDesign™ as a framework for exploring, envisioning and enacting innovations to their teaching practices. We recognized that teachers were certain of one thing: they did not want “one more thing” to add on to their busy days. 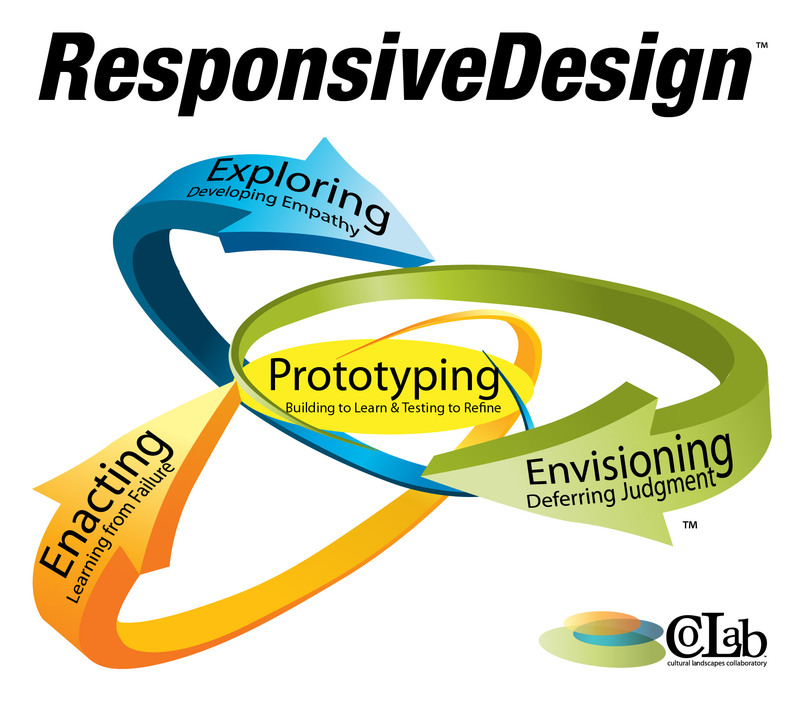 Therefore, ResponsiveDesign™ became a model for teachers to think about their existing teaching practices as they intersected with the district’s literacy curriculum. Because each grade level had identified Principled Elements of a Writing-Rich & Writing-Strong community of learners by engaging in a design challenge, these elements grounded ways to think about reading and writing as recursive technologies to interact and learn from any kind of curriculum. Within this second level, by year’s end when teachers had an opportunity to meet within their schools to “become whole,” they were able to develop actionable steps to continue their professional growth as a school. At this time, moreover, teachers within schools got closer to developing a shared pedagogical language of and for their teaching practices. The third level of growth emerged at the level of praetorships between the CoLab and schools: visibility for doing great work. Because we only work overtime with schools, there are natural opportunities to grow together as shared stakeholders in the outcome of our work. Teachers’, administrators’, students’, parents’ and CoLab’s perspectives grew into a shared mission to become a Writing-Rich & Writing-Strong district community. The principled instructional model the CoLab co-developed for Bellham District 118 demonstrates how innovation and teacher-based leadership can grow when there is a shared effort and collective endeavor between a university entity and community-based school. An articulated theory-base for our work. We took this to signify an articulation of principles of practice that guides our work that can be generalizable from the smallest to largest scales of resolution across diverse learning settings. Innovative partnerships with community-based stakeholders and institutions. We took this to articulate the theoretical and pedagogical importance of innovative partnerships within a 21st century learning landscapes, where diverse settings can learn from each other. Innovative approaches to professional development. We understood this as a call to articulate the processes we engage in at our site that enables transformational professional learning to take place in the learning ecologies, or cultural landscapes, where we do our work. Focused on those three areas is a powerful focused start. And when paired with an other powerful challenge that NWP’s chair of the board of directors said (paraphrased): “NWP can articulate the focus for learning in the 21st century,” then we believe our CoLab is, as are numeraous other sites, spot-on in its endeavors. We returned from that Annual Conference more certain than ever before in the short 3 years of our site’s existence, to articulate at all levels the dimensions of our work and the importance of professionals developing professionals as the key to strengthening professional development in and out of school. An aspect that has become critical to our site work is our ability to articulate the theories in which our work is grounded, and, that inform how we go about thinking about the work we do with schools in our service area. Competition from for-profit organizations can easily squeeze out any site’s endeavors if the site is not attuned to articulating how it thinks about developing tailor-made professional development for schools with a diverse set of needs. Gone are the days where we can “pull off the shelf” an amazing Teacher-Consultant to develop a session on Writing Workshop, per se. Rather, if we do not learn a language for how to talk about and unpack the specific discourses in our schools (e.g., RtI, Common Core, etc. ), then we run the risk of becoming irrelevant to what the school articulates to be its immediate professional needs. We’ve learned that our ResponsiveDesign™ process allows us to engage in critically important ethnosleuthing in order to learn what native ways of doing, being and believing exist within the school cultures in our service area. ResponsiveDesign’s ‘developing empathy’ comes in quite handy to develop a grounded view of what the actual perceived needs are. From there, engaging in an ideating process as a DesignTeam, we’re able to envision many possibilities, that are grounded in NWP’s process-pedagogy approaches, to tailor make a model that meets the district’s needs. Then, once enacted, when viewed as a larger-resolution prototype, the DesignTeam critically reflects upon the data it collects from each enacted session and revises it upon the emerging successes and identified weaknesses, or failures in the enacted plan. From this interactive perspective, therefore, ResponsiveDesign™ helps us develop habits of mind where we are building or making in order to learn. As we look to the 2011 Annual meeting in Chicago, we at the CoLab want to work with fellows sites who are audacious to take on what if? stance and posture to their work and purpose for being. What if we developed site communities as theory builders, ideas articulated from the powerful work done by teachers and educators, students and learners, parents and community-based stakeholders? What if we developed shared ways to collaboratively take back what’s rightfully ours: professionals developing each other as stronger professionals, in terms of how we negotiate professional contracts with schools; truly innovative ones. What if we helped each other learn to make inroads into schools we previously thought had been ‘no way!’ places for us to do our work? What if we systematically took back our language of teaching and learning, since usurped by curriculum publishers which are nothing more than thinly disguised ‘one-size fits all & no-thinking necessary’ flimsy products of mass consumption? *Copyrighted images and content are the intellectual property of Ralph A. Córdova Jr. Duplication is authorized by author, and appropriate citation of materials is requested.